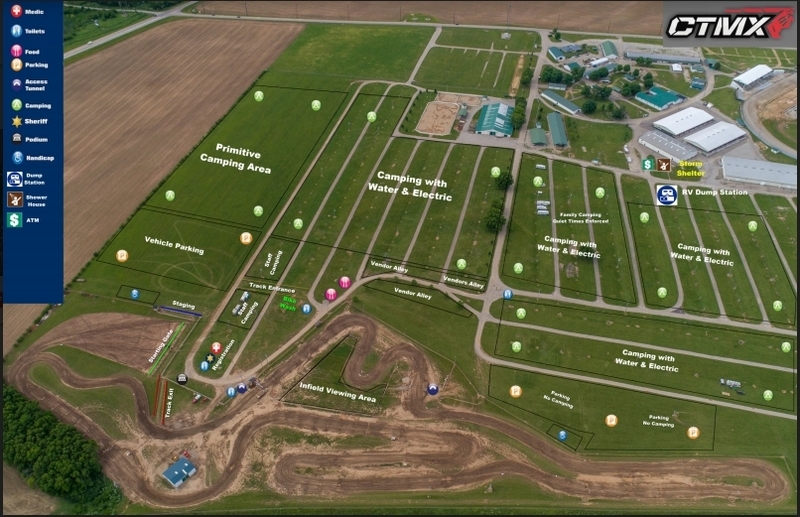 Welcome to CTMX, voted “Ohio’s #1 Motocross Track” the last two years! Our facility will blow your mind as a MX racer who is used to traveling and parking in any spot they can find! We have over 1300 campsites with water and electric hook up, onsite shower house and free dump station when you exit. There are bike wash stations, vendor row, multiple food vendors, primitive camping area, sprinkler system on start gate, live timing and scoring with escore, infield view area, trackside radio (90.7), live announcing, podium interviews, bleachers for viewing and soooo much more! We even set up a mister system to help cool you down on those hot hot summer days in Ohio! We try to keep our event packed full of activities so that everyone feels involved and relaxed but most of all leaving with that feeling of FUN! We have different activities at each event but some of those include the mechanical bull, a pro dunk tank, kid outdoor movies, live bands, moto limbo, bike barrelling, team racing, bike relay races, STRIDER track qualifying and racing, etc. We are so proud of how loved our halloween event has become! Moto Mayhem (Oct. 21/22) is quickly becoming one of our largest events featuring the mechanical bull, camper to camper trick or treat, costume contests, pumpkin decorating, chilli-cook off, etc.